Eco-friendly living is more than a one-time decision and more than a catchy buzzword. It’s a daily, routine awareness of how our actions affect the world around us. This extends to real estate—the types of homes we own, the products we use to clean them and the habits we form while living in them. And it also extends to facets of home ownership beyond day-to-day living, such as home buying and, of course, home selling. Did you know that when you are selling your home, there are eco-friendly choices you can make? Preparing: It’s no secret that preparing your home for sale is a demanding task. You need to declutter, reorganize, stage. What results from all this work? Lots and lots of trash—items you no longer want or need. Instead of tossing it all into a landfill, take the time to recycle or repurpose, giving usable items to charity or people who can use them. Bonus: Less to pack and transport when you move into your new place. Marketing: Because the Internet is the #1 tool for marketing real estate, it makes sense, both from a practical and an environmental viewpoint, to use it to sell your home. List with BuyOwner.com to create a full-color, 24/7 ad that highlights your property’s strengths. Through your Seller Tools, you can also print out customized brochures on recycled paper! Showing: Once your home is on the market, you’ll spend a lot of time keeping it in showing condition and showcasing its features. At open houses and scheduled showings, create eco-friendly spreads of snacks, complete with cloth napkins, pitchers of water and organic fruit. Another idea: Fill the living spaces with vibrant plants to create a seamless sense of indoor/outdoor enjoyment. Moving: If you’ve prepared for sale well, you’ll eliminate clutter and only need to move what is valuable to you. Try to find and save old boxes, packing materials, etc., to avoid buying new ones, and use those to pack up your belongings. How long you leave your holiday decorations out is up to you. Some homeowners take everything down today, the day right after Christmas, and others will leave things up into the new year. 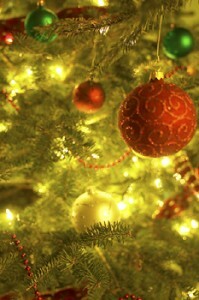 But one thing’s for sure: if you’ve put up and decorated a tree in your home, you will need to take it down sometime. Do you know the best ways to dispose of it? Buy Owner is here to help you get the information you need! Fact: Did you know that most real Christmas trees do not come from a natural forest? Instead, they are home-grown on farms all across the country! Many homeowners prefer real Christmas trees because of their sweet pine scent and connection with the outdoors. As an added bonus, like any piece of foliage, a real Christmas tree will take in harmful carbon dioxide and release out fresh oxygen. Of course, there are negatives in having a real tree: It requires regular watering, and needles will shed, falling to the ground. You may have to vacuum a little more than you would like during the holidays. When it comes time to dispose of a real tree, which should last a week or two indoors, the most eco-friendly option would be to turn it into mulch. This requires a little more time and concern than just throwing it away with the rest of your trash, but it helps the planet. Alternatively, if your tree still has the roots intact, you could try to replant it outside once the holidays are over. Just bear in mind: if the tree has spent more than a week in your home, it has adjusted to the warmer climate, and if you live in a colder climate, the tree will not be able to survive outdoors. Because of the minimal cleanup and variety of sizes and colors available, many homeowners choose artificial Christmas trees. The benefits abound: artificial trees last forever; reuse them year after year! That’s the best green option there is! Also, nowadays, fake trees often come pre-lit! No more dealing with the hassle of untangling lights to string on the tree. Some artificial trees look like the real thing, and you can easily purchase any size you like. From a one-foot, table-top tree to a 12-foot, towering pine, it’s easy to find the perfect size for your desk in the office or to place in front of the large picture window in the living room. The major downside of artificial trees is that most are made from polyvinyl chloride (PVC), which is not very friendly to the environment. PVC is not biodegradable. So if you decide to ditch the fake tree for a real one, there is no eco-friendly way to dispose of it. However, because artificial trees are so easy to maintain, you could continue using the same one for years to come. In conclusion, celebrating the holidays with either a real or an artificial Christmas tree has its ups and downs. Consider the economy, the environment and your personal decorative style when choosing one and deciding to dispose of it or replace it. As always, happy holidays from Buy Owner!